Afterglow wine lights are bottle candles that burn lamp oil, fit most wine bottles. Many choices: handcrafted ceramic, brass, pewter, etc. 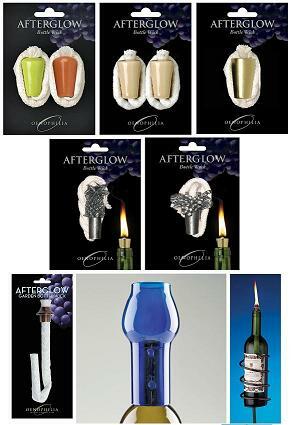 These Afterglow wine bottle wicks turns a favorite wine bottle into a romantic candle. Fill the bottle with lamp oil, place wick into oil, and light. "Wine Bottle Candle Lights make a great little additional gift when bringing a bottle of wine to somebody's house."